'Everyone knows the duck schwarma at Momed is fantastic' - but did you know that they have an awesome weekend brunch as well? Every Saturday and Sunday, from 10am-3pm. Momed is actually short for "modern mediterranean" - and is a sleek but cozy space that offers a restaurant, deli, espresso bar and marketplace in one. On a lazy Saturday morning (morning means sometime after noonish on weekends for me), after enjoying a SpaWeek deal ($50 for treatments that normally run around $100 and up!) closeby, I decided to stop at Momed for an off the beaten track brunch. Momed is an affordable dining option in Beverly Hills, and has both a casual indoor restaurant space, as well as outdoor front patio seating. I like both, but since it was a sunny day I chose to sit outside. 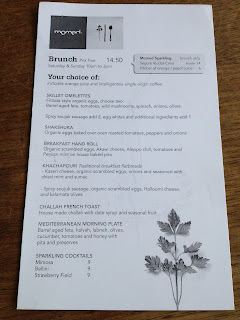 And then I saw it: the mouthwatering options on their brunch menu. Basically it's a prix fixe brunch: you get your choice of entree + Intelligentsia coffee + orange juice = $14.50. All of the choices looked fantastic, but the ones that struck me as more unusual were the Khachapouri "traditional breakfast flatbreads". There were two options: the "Kaseri cheese, organic scrambled eggs, onions and seasoned with dried mint and sumac" seemed more to be different in flavor profile, whereas the "Spicy soujok sausage, organic scrambled eggs, Halloumi cheese and kalamata olives" seemed to have more unique ingredients. My super friendly and helpful server Malena (more on her later!) validated this line of thinking when she recommended the sausage flatbread - so I went for it. I really had no idea what to expect - maybe breakfast pizza with mediterranean toppings. 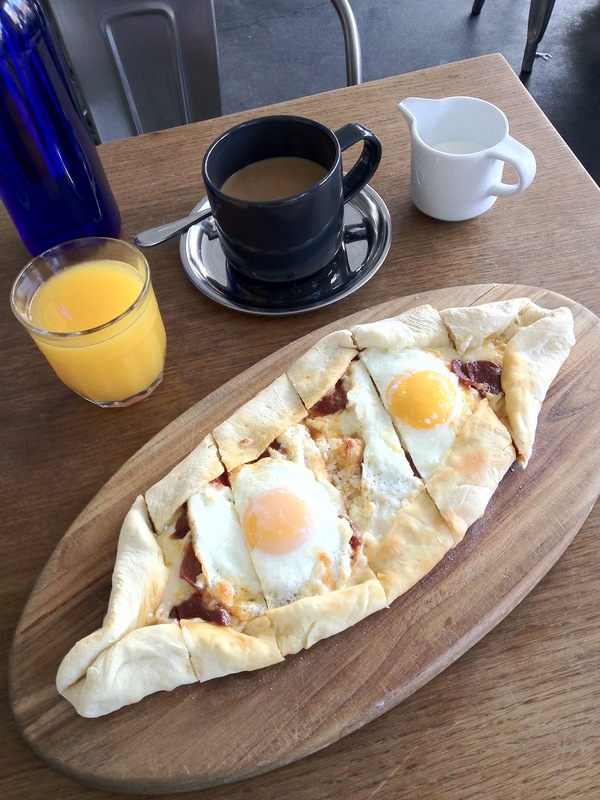 What arrived was a fantastic creation that was like a thin-crust pizza but roughly oval shaped, topped with breakfast staples with a mediterranean twist and wrapped around the edges like a calzone. With eggs baked in with the flatbread. Despite the menu listing 'scrambled eggs', they actually came sunny-side up, which I actually prefer both cuz it looks way more fun that way, and I get to have my unadulterated, beautifully runny yolk - the way I usually like to have my eggs anyway. The flatbread was fresh baked and incredibly fragrant, while the sausage (which actually resembled and tasted like tiny pieces of spicy pepperoni - with mediterranean flavoring) lent a bit of heat. The Halloumi cheese was perfectly melted in (NOT a thick, congealed mess which is one main reason I don't like most pizzas) and everything just worked together in harmony. I'm not normally a big coffee drinker, but do like Intelligentsia coffee and couldn't resist the fragrant (and refillable) cup along with good ole OJ (also refillable) with my flatbread. All in all, a lovely, easy way to kick off the day on a sunny SoCal morning. And for dog lovers - your best friend is welcome on the patio as well. Aside from the awesome food / brunch set - I wanted to take a moment to rave about service as well - I don't know if Malena is representative of all of the servers at Momed, but she was a big part of making my brunch experience great. It was fairly busy out on the patio that morning and she seemed to be the only one helping with all the tables, but never wavered from her sunny disposition - even with the annoying non-customer who perched on the patio to loudly complain about the overabundance of actors in this town - all while flirting with the also cliched director guy and trying to get him to take her number (an oh-so-LA moment?). Malena's one of those people who you can see are just genuinely happy, enjoy their jobs no matter what they're doing, and want to make sure you're having as good a time as she is. And she had pretty good intuition about when to stick around and chat, and when to just hover a ways away - offering help if needed but giving you enough space to enjoy your meal. I don't normally review service in this much detail, but really wanted to say that I wish more people were like Malena - because everyone she served that morning left in a good mood and ready to take on whatever the day may bring. And people like her are a reminder that every person can make an impact on someone else in their lives - it doesn't have to be ground-breaking work like philanthropy trips overseas for victims of great tragedy - it can be as simple as spreading a little bit of sunshine to everyone you interact with in your daily life, in a moment as undramatic as neighborhood brunch. In any case, a week later, I'm still dreaming about the insanely delicious flatbread. Hope to be back to Momed soon! I LOVE this place. I've been there twice in the past month even though it's not in my 'hood or on my way home. You've got to try the avocado hummus next time - creamy and delectable!